At this time of year it is, as we all know, traditional to sum up the best and worst of the year just gone, and/or make plans, resolutions or predictions for the year to come. I’m feeling a bit sandblasted by the thought of doing that (maybe it’s just the Wellington wind). But I’ll give it a bit of a go at the end of this post. I’m chuffed that my own novel made it onto a few “best” lists for 2013, and I’d like to shout proudly about those those; but if I’m doing that, it’s only fair to share the love and send some shout-outs of my own. During the last few weeks The Life and Loves of Lena Gaunt has popped up on a few “best of” lists for 2013. I was so delighted that Liz Byrski (writer, broadcaster, academic), writing on her Facebook page a few days before Christmas, named Lena her favourite book of 2013. 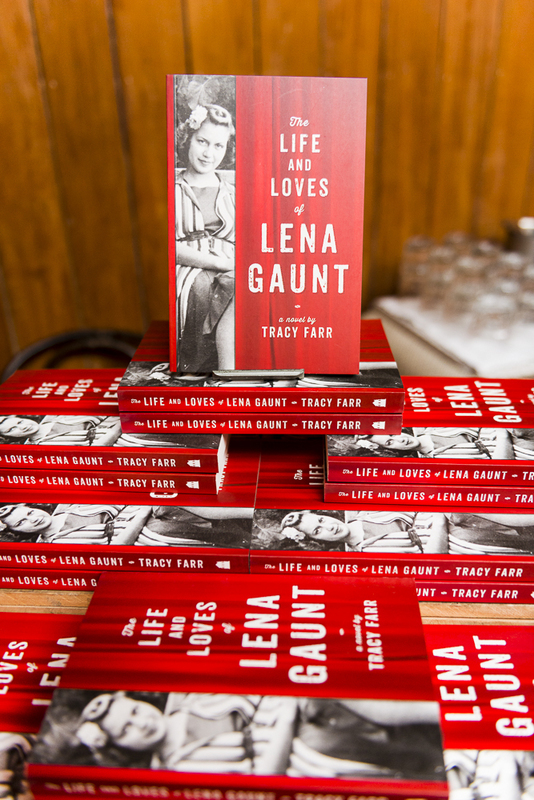 My favourite book of 2013 is THE LIFE AND LOVES OF LENA GAUNT, by Tracy Farr. I read the chapter of this book that’s included in the SUMMER LOVIN’ collection for which I wrote the introduction. The chapter was so beautiful I had to buy the book. It’s beautiful story of life, love and music, told by the most engaging character, Lena Gaunt, who is eighty. The older woman’s voice, her humour, her sensibility is entirely convincing. From the first page I wanted her as a friend. The writing is beautiful, sensuous and captivating. I sighed each time I had to put it down, and was waiting to go back to it. Keith Richards’s Life convinced me regret is for wimps. Best line: “Mick’s very good with the locals.” The Life and Loves of Lena Gaunt by Tracy Farr is a mellower riff on music – a sensual, sensory treat. Kate Atkinson tells Life After Life with a confidence that makes it plain she won’t give a damn if you don’t like it. Another Christmas present was being listed among (blogger, writer, bookseller) Emily Paull’s “Best Books of 2013” in very fine company indeed. 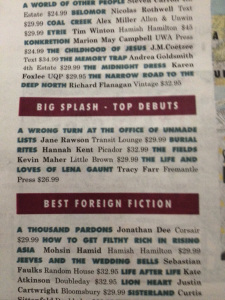 And in the lead-up to Christmas, theAdelaide Advertiser (Adelaide’s daily newspaper) on 16 December listed Lena as one of four “Big Splash — Top Debuts” books for 2013 — again, in mighty fine company. A week or so before Christmas, I was awarded the R.A.K. Mason Writer’s Fellowship, which I’ll take up in April 2014. That’ll give me three weeks of time and space in retreat to work on the new novel, the follow-up to The Life and Loves of Lena Gaunt. …a terrific example of Farr’s ability to, as Emily Dickinson wrote, “Tell all the truth but tell it slant”. Like her fictional creation Lena, Farr translates the world. In Lena’s case, it’s via music; in Farr’s, via words. The article features the logo of Perth Festival 2014, and reveals that I’ll “be in conversation with Liz Byrski at the 2014 Perth Writers Festival”. That is some extremely exciting news that I’ve been sitting on for some months, and I can’t wait to tell more once the Perth Writers Festival programme is officially available, from 15 January. I have vowed to note down the books I read in 2014 so that I don’t — as now — get to the end of the year and look back on a bibliographic blur. Here are some memorable books (with The Big Music my most memorable) I read in 2013 — there were so many others I enjoyed, but these are those that glow brightest out of the haze of the year just finished. So many (and so many more I missed), but these films (all but the last of which I saw at the 2013 New Zealand International Film Festival in Wellington) have stayed with me — particularly Stories We Tell, my most memorable film of the year. Stories We Tell and 56 Up reflected elements of the novel I had published in 2013; and Rachel Getting Married has elements in it of the novel I am starting to write. Call me slow on the uptake, but it’s only this past year that it’s really dawned on me how very many talented and committed people are out there writing about and supporting other people’s writing. Kirsten Krauth, Emily Paull, and the indefatigable and prolific Lisa Hill and her ANZ LitLovers LitBlog, just for starters, are some of the amazing writers and bloggers I’ve discovered this year, since my novel came out; others, like Graham Beattie’s Book Blog, I’ve been aware of (and in awe of) for some time. I don’t know how they do it, how they have the energy and time, but they’re amazing. Initiatives like Australian Women Writers Challenge are also extraordinary, and engage (and connect) both readers and writers. I take my metaphoric hat off to you all. Don’t stop doing what you do. None of my most memorable books of 2013 are by first-time authors, but I suspect that’s because — despite good intentions, and many such titles on the to-read list — I didn’t seem to get around to reading any, or many, in 2013. So in 2014 I hope to read more first fiction, from debut writers, and share the love.